Here, meekness appears with gentleness, as though a similarity exists alongside a specific difference. The reason for this is that Apostle Paul is dealing with conflict. To the church at Corinth, Apostle Paul begins a defense of his apostolic authority, showing that he had a right to regard himself as sent from God. He begins his argument by appealing to the gentleness and meekness of Christ to vindicate his own evenhanded approach, entreating them not to give him occasion to display the boldness and severity that he could also use. He had no wish to be so bold and severe in his discipline of them. The contrast between meekness and severity shows starkly here. 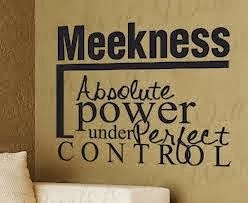 Meekness is a specific virtue, tool, way or fruit of the spirit that is excellent in dealing with conflict or potential conflict within relationships. Some, who had invaded the congregation and claimed to be apostles, accused Apostle Paul of being courageous and bold when writing letters from a distance, but timid and weak-kneed when personally present. They were, in effect, accusing him of being all bark and no bite. They had badly misjudged him through a combination of his gentle and reasoned approach when founding the congregation and, apparently, what they considered his weak physical appearance and plain, uncultured speaking. But Apostle Paul, though he may have appeared weak to them, was in reality meek, not weak. He was prepared to fight this poisonous, destructive evil within the congregation with all his spiritual power—which was, as the Bible shows, considerable. Apostle Paul did not seek to show himself to the congregation as a flamboyant, charismatic personality. He was not there to showcase himself. He and his presentation were not the centerpiece and spiritual strength of the church. The Father, Jesus Christ and the gospel of the Kingdom were Apostle Paul's focus, and he wanted the people to focus their lives there as well. Thus, he presented them in the manner he did. √ has ceased to think or care about himself. √ His pride and self-will have been crucified. √ He does not measure the importance of events by their relation to his personal comfort or what he will gain from them. √ He sees everything from God's perspective, seeking only to serve His purpose in the situations life imposes. And when Moses saw that the people were naked; (for Aaron had made them naked unto their shame among their enemies:) Then Moses stood in the gate of the camp, and said, Who is on the Lord's side? let him come unto me. And all the sons of Levi gathered themselves together unto him. 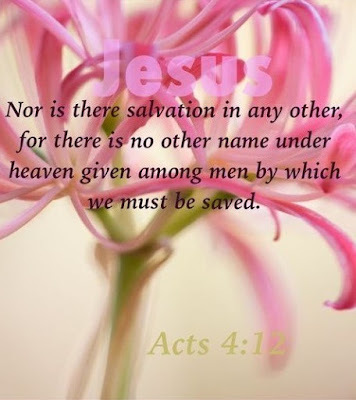 And he said unto them, Thus saith the Lord God of Israel, Put every man his sword by his side, and go in and out from gate to gate throughout the camp, and slay every man his brother, and every man his companion, and every man his neighbour. And the children of Levi did according to the word of Moses: and there fell of the people that day about three thousand men. (Exodus 32:25-28). Against evil this meek man was as stern as steel. How a meek man reacts depends upon what he discerns God's will is for him within that circumstance. Because the meek man sets his mind on God's purpose and not his own comfort, ambition or reputation, he will offer implacable resistance to evil in defense of God yet react with patience, kindness and gentleness when others attack him. Jesus set a clear example of this pattern of reaction too. He made a whip of rope, and with stern and vehement energy, overturned the tables and drove the livestock, their sellers and moneychangers from the Temple because they had turned God's house into a common bazaar by their sacrilege. With simple, forthright, firm instructive answers and incisive questions, He met the twisted, intellectual, carnal reasoning of the scribes, Pharisees and Sadducees. This virtue is a strong defensive wall against self-righteousness and intolerant and critical judgment of others. Yet neither does it excuse or condone sin. Rather, a meek person understands it more clearly, thus his judgment is tempered, avoiding reacting more harshly than is necessary. On the flip side are those under authority, and this is where Apostle Paul's main emphasis is placed in Titus 3. Humans, by nature, tend to be very sensitive, critical and harsh in their judgments of those over them. It frequently results in slanderous attacks and quarrels against those in authority—sometimes even in revolutions. Apostle Paul advises us to be non-belligerent, considerate, unassertive and meek. If the fruit of meekness has been produced in either or both parties, peace and unity are more possible because a major tool is in place to allow both to perform their responsibilities within the relationship correctly. A Natural Meekness. What has gradually emerged from these many elements is that meekness is what results when one's spiritual knowledge, understanding and passions are in right balance. A carnal or natural meekness exists, but it is born from a person simply not wanting to become involved, from not understanding what is happening or from a lack of firmness. It is usually timid, conforms readily, and is easily deterred from doing good and persuaded to do evil. It sometimes forms the great defect in religious people's character, as in the cases of Eli and Jehoshaphat. Both Eli and Jehoshaphat were what we would call "good men." They were religious, pious men who sought God within the framework of their own interests. God reveals, though, that they also had a serious character weakness that kept them from glorifying God to their highest potential and caused serious punishments and even curses to come upon them. This is not the type of meekness that God requires of us! 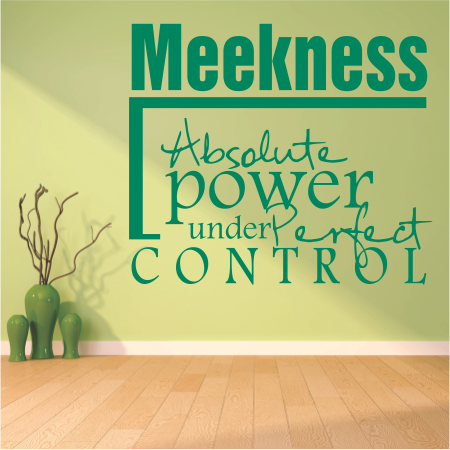 Our meekness is derived through our faith in Christ Jesus and His Holy Spirit residing within us which gives us absolute power under the perfect control of our Lord and Savior!